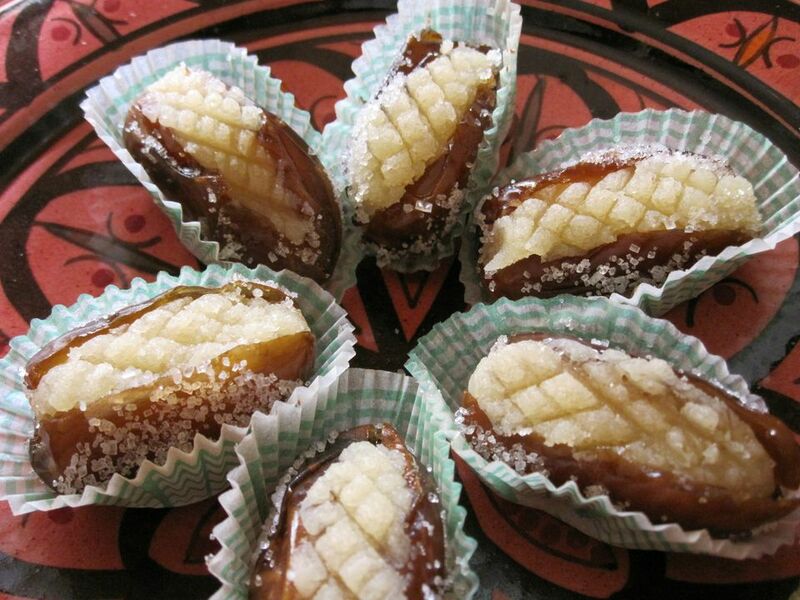 Stuffed dates are a Moroccan sweet traditionally served during Ramadan and special occasions. Orange flower water and cinnamon are used to flavor the almond paste filling. If you prefer, you can replace the orange flower water with lemon zest. Some Moroccans divide the paste and tint it various colors such as green, red, blue and yellow, but I find the stuffed dates more appetizing with natural color. Garnish the stuffed dates as desired with granulated sugar, walnut pieces or even a little shredded coconut. Select firm, chewy dates. In Morocco I use a variety called Deglet Noor. Blanch and peel the almonds. Bring some water to a boil in a small pot. Add the almonds and leave to boil for one or two minutes. Remove the almonds from the heat and drain. While the almonds are still warm, remove the skin by pinching individual almonds between your forefinger and thumb. Leave the skinned almonds to cool. Process the almonds, sugar and cinnamon in a food processor until the almonds are a powdery mixture which is moist enough to pack. Add the butter and orange flower water and continue processing until a smooth paste forms around the blade. Remove the paste from the processor and if desired, divide and color the paste by kneading a drop or two of food color into each portion. Roll small cylinders of almond paste the same length as your dates, but only about 1/3 the diameter. Take a date, make a vertical cut deep enough to remove the pit, but not so deep as to cut the date in half. Discard the pit, insert a cylinder of almond paste, and press the sides of the date firmly around the paste, while leaving a portion of paste exposed. Repeat with the remaining dates and almond paste. Store the stuffed dates in an airtight container in the fridge. Bring them to room temperature before serving.